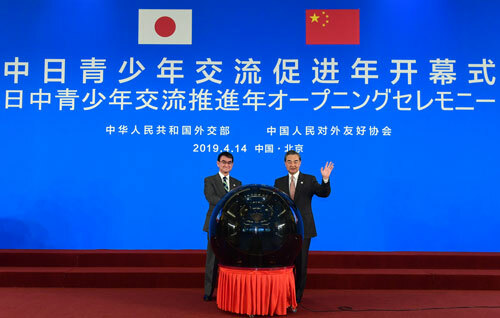 On April 14, 2019, State Councilor and Foreign Minister Wang Yi and Foreign Minister Taro Kono of Japan jointly attended and addressed the opening ceremony of China-Japan Youth Exchange Promotion Year in Beijing. 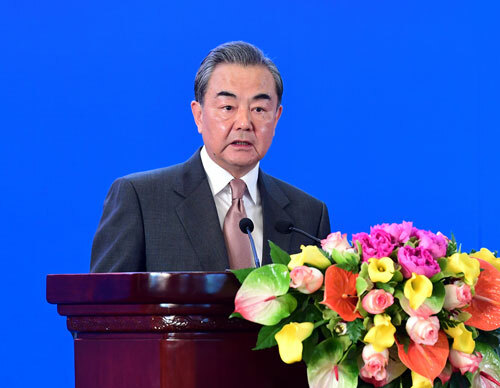 Wang Yi expressed congratulations on the successful opening of the China-Japan Youth Exchange Promotion Year and said that China and Japan are close neighboring countries separated only by a strip of water. Although bilateral relations have undergone ups and downs and kept on moving forward amid the winding course, peace and friendship have always been the shared aspiration of the two peoples. Under the concerted efforts made by the two countries’ leaders and all sectors of the society, China-Japan relations have returned to the right track since last year. The two sides strengthening youth exchanges will generate a positive and profound impact on enhancing the mutual understanding between the two peoples and consolidating the friendly public opinion foundation of the two countries. Wang Yi pointed out that young people are the hope of a country and a nation and represent the future of China-Japan relations. It is hoped that the young people of the two countries will have high aspirations to shoulder their responsibilities and missions, learn from the history of bilateral relations, and take over the baton of maintaining the ever-lasting China-Japan friendship from their predecessors. It is also hoped that the young people of the two countries will unite their knowledge and action, take active actions, carry out rich and colorful exchange activities, and strive to become the most active force in the non-governmental exchanges between the two countries. We hope to see that the young people of the two countries can keep pace with the times and adopt a more open and inclusive attitude to view each other’s development and progress objectively and rationally, so as to work together to contribute to the mutually beneficial cooperation and common development between China and Japan. 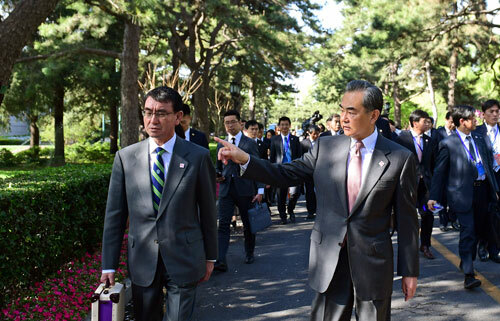 Taro Kono said that under the joint efforts of both sides, Japan-China relations returned to the right track last year. The young people shoulder the future of the two countries’ relations. It is crucial to establish mutual understanding and trust among the young people for stable development of Japan-China relations. He hoped that the young people of two countries can strengthen communication and cooperation and keep close exchanges with each other, thus serving as a bridge for Japan-China friendship and making contributions to deepening bilateral relations. It is a concrete achievement for improving China-Japan relations that in 2018, the two countries designated the year 2019 as China-Japan Youth Exchange Promotion Year, and decided to arrange 30,000 young people to make exchanges and mutual visits in the next five years.